NIH study identifies potential new target for malaria drug development. 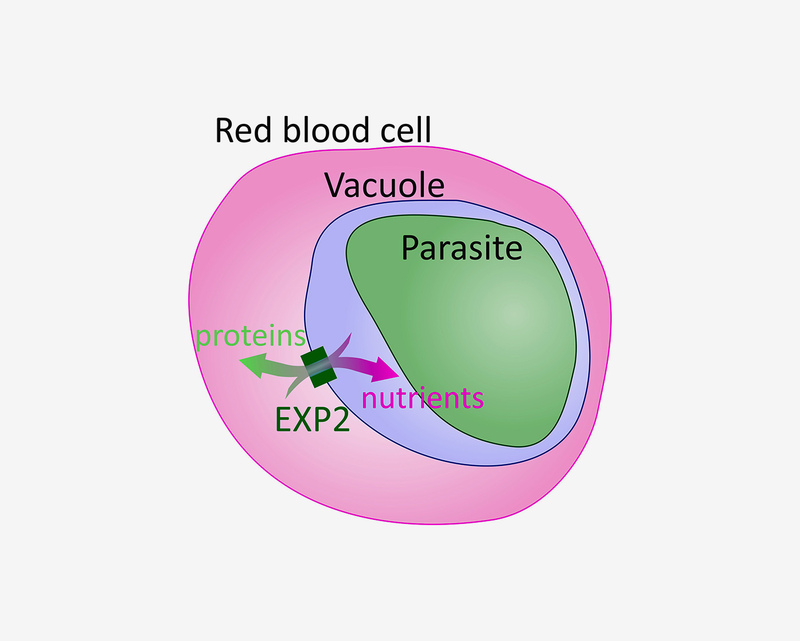 Researchers from the National Institutes of Health and other institutions have deciphered the role of a key protein that the malaria parasite Plasmodium falciparum uses to obtain nutrients while infecting red blood cells. Their study appears in Nature Microbiology. According to the World Health Organization, in 2016 there were an estimated 216 million malaria cases and 445,000 malaria deaths. P. falciparum is responsible for most malaria-related deaths globally. The parasite remodels the red blood cell it infects to obtain nutrients. During this process, the parasite secretes hundreds of proteins that need to be transported from the vacuole, the compartment in which the parasite resides, to the interior of the cell. A group of proteins, called the Plasmodium translocon of exported proteins (PTEX), has been shown to be essential for transporting materials to and from the vacuole. Previous studies have uncovered the function of one of the proteins in the PTEX group to reshape proteins for transport, but the function of other proteins in the group have not been well understood. In the current study, researchers analyzing blood cell cultures from healthy people determined that the PTEX protein EXP2 forms a channel in the vacuole membrane, which allows for passage of proteins and cellular nutrients to supply the parasite. The researchers hope that their discovery will lead to the development of new drugs to prevent formation of the channel and block the transport of nutrients and proteins to the parasite. Joshua Zimmerberg, M.D., Ph.D., chief of the Section on Integrative Biophysics at NIH’s Eunice Kennedy Shriver National Institute of Child Health and Human Development, is available for comment.